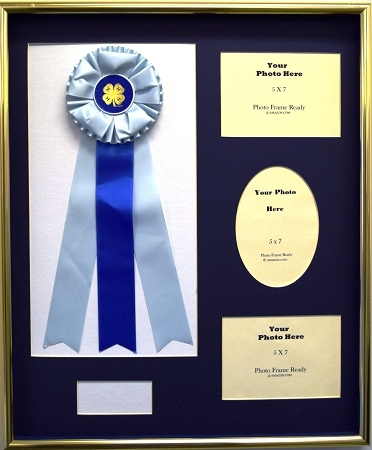 Shadow box frame overall size 20x23 Gold metal frame with 1 inch depth holds ribbons and photos also includes name plate area. Acrylic front has a channel track and ribbon opening 17-1/2 (L) x 9-1/4 (W) along with one oval and two rectangle 5x7 photo openings. Navy blue matting also includes mounting board and wall hanging system.